One of the big sellers at this years CES was bluetooth speakers. As we become more and more reliant on our smartphones for entertainment, so we constantly look for ways to free ourselves of the wires that tie our smartphones to our accessories. 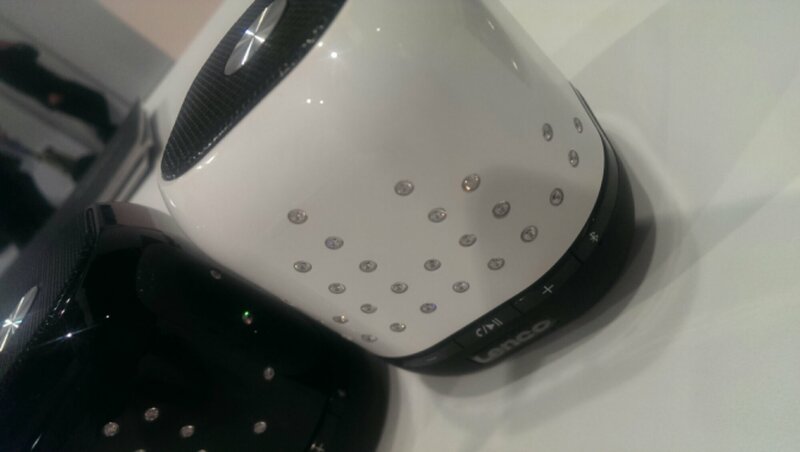 This article is a review/comparison of my two favourites from this years show, The Lenco and the ihome. As you can see both speakers are aesthetically very different. The iHome has a very 80’s retro feel to it, reminding me of the speakers from a boom box and the bright colours associated with that wonderful decade. The lenco on the other hand is styled in the more modern “Black and Diamonds” which certainly makes it seem more refined and of better quality. When comparing these two products I used my Jawbone Jambox as the baseline for what I believe a Bluetooth Speaker should sound like, and was surprised at the difference between the three devices. Given the significant difference in prices, all three were of a comparable sound quality. Whilst the Jambox had a deeper and richer tone than the other two it was significantly quieter, to the point where it was unusable in any but the quietest situations. Whilst I believe that quality sound should be the paramount reason to buy one of these devices, you have to be able to hear the thing to enjoy the quality! 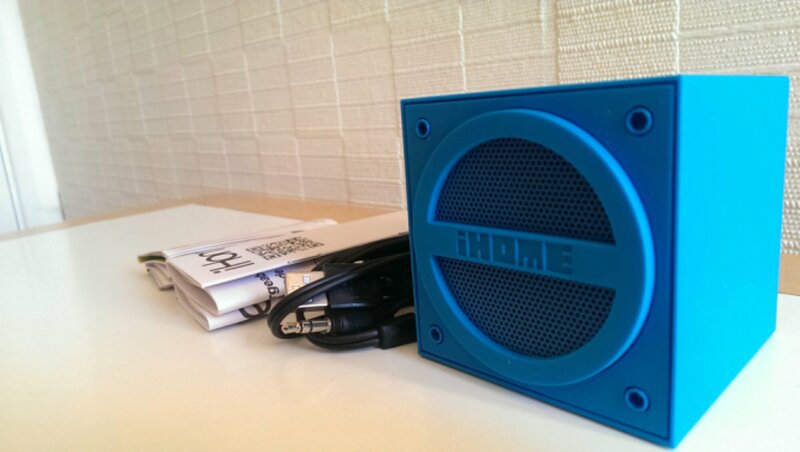 The IHome’s square and solid shape makes it a great gift for the teenager in your life. It’s bold and although the fidelity of the sound is not as high as the lenco, the volume is more important in this case. My teenage daughter doesn’t really care how good it sounds as long as it is loud enough to perforate her eardrums. The slightly soft touch plastic the ihome is made from gives it a premium feel and the range of colours will suit any young persons palette. The Lenco feels much more like a premium product. It has a high gloss feel with Swarovski™ crystals in two available patterns, waves and equalizers and also comes in black or white. The sound quality is arguably better than the iHome although the volume level is slightly lower. One big selling point of the Lenco is the inclusion of a handsfree system to the speaker. This allows you to accept calls through the speaker if you are interrupted in your listening. I am a big fan of this as it keeps me connected all the time without the need to miss either the music or the phone calls. Each of the speakers seem to have specific rooms in the house in mind. The iHome seems to be designed for a young persons bedroom or the kitchen. Places where vibrant colour and loudness mean more than style. Using the iHome in the kitchen works wonders as I can hear it over the banging and chopping noises of me cooking dinner. The lenco however seems more fitted to the dining room once the dinner is done. The Crystal decorated little device looks lovely nestled next to a centre piece, playing soft relaxing music while you eat. It is an altogether classier little product. Both of these speakers also have an Aux in which surprised me and if you are so inclined you can connect them together to form a “daisy chain” of connected speakers, each one adding to the sound level. This changes both devices into a serious choice when it comes to parties. Both of these devices are worthy of your money. If it were my money I would opt for the Lenco for its ability to play phone calls as well as music but from a purely “Bluetooth speaker” point of view it’s all dependant on taste.